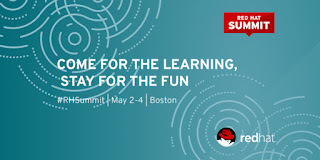 Red Hat Summit next week is shaping up to be one of the best ever! And if you are a Drools or jBPM enthusiast, you will be busy: another top presentation that we have lined up for you comes from a partnership between Signavio and Red Hat. Duncan Doyle and Tom Debevoise will be driving the show on this one with a great example of how do model processes (and a few decisions) with the BPMN and DMN standards using the awesome tools from Signavio, and then deploying those models into the solid Drools and jBPM engines for execution! 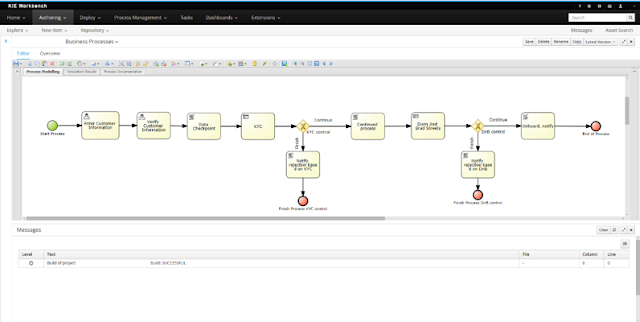 This is End to End BPM: from Process Modeling to Execution with Signavio and Red Hat ! Join us on Wednesday, May 3rd, at 3:30pm! For nearly a decade designing processes in Business Process Model Notation (BPMN) has been a best practice for aligning business and technical objectives. With BPMN, the business analyst or subject matter expert can precisely define the interactions of customers, systems and trading partners with the activities and events that drive them. Because the notation is a standard, the meaning of the process model is unambiguous. With the Signavio Process Manager, all stakeholders can collaborate on the process model using an ability to commutate comments and concerns and a shared definition of terms. As shown in the figure 1, BPMN activities can denote where forms, services and scripts are needed. BPMN is more than a drawing convention. Compliant software can export the diagram in an XML format that other systems can read. Signavio and Red Hat have leveraged this capability so that processes and more can be exchanged. To create an executable process, the technical team would then and the code for user forms, scripts and services. So processes in the Signavio Process Manager can be exported to the BPM Suite for this objective. 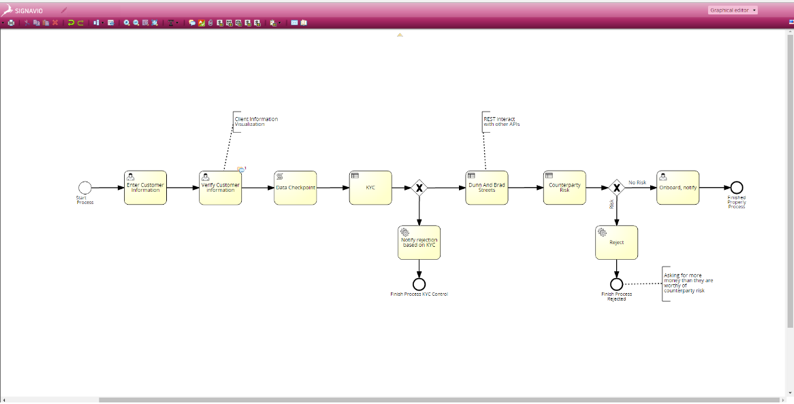 Decision logic can be exported from the Signavio Process Manager and incorporated into the KIE workbench. The process in figure 1 and 2 is controlled by the decision in figure 3. Just a few... million... rules... per second! How would you architect a solution capable of executing literally millions of business rules per second? That also integrates hybrid solutions in C++ and Java? While at the same time drives latency down? And that is consumed by several different teams/customers? Here is your chance to ask the team from Amadeus! During the session they will talk about their journey from requirements to the solution they built to meet their huge demand for decision automation. They will also talk about how a collaboration with Red Hat helped to achieve their goals. Join us for this great session on Thursday, May 4th, at 3:30pm! We have an event packed full of Drools, jBPM and Optaplanner content coming next week at the Red Hat Summit, but if you would like to know more about Decision Model and Notation and see a really cool demo, then we have the perfect session for you! At the Decision Model and Notation 101 session, attendees will get a taste of what DMN brings to the table. How it allows business users to model executable decisions using a fun, high level, graphical language, that promotes interoperability and preserves their investment preventing vendor-lock-in. But this will NOT be your typical slideware presentation. We have prepared a really nice demo of the end-to-end DMN solution announced by Trisotech a few days ago. During the session you will see a model being created with the Trisotech DMN Modeler, statically analyzed using the Method&Style DT Analysis module and executed in the cloud using Drools/Red Hat BRMS. Come an join us on Tuesday, May 2nd at 3:30pm. It is a full 3-course meal, if you will. And you can follow that up with drinks at the reception happening from 5pm-7pm at the partner Pavillion where you can also talk to us at the Red Hat booth about it and anything else you are interested in. Trisotech, a Red Hat partner, announced today the release of the DMN Quickstart Program. Trisotech, in collaboration with Bruce Silver Associates, Allegiance Advisory and Red Hat, is offering the definitive Decision Management Quick Start Success Program. This unique program provides the foundation for learning, modeling, analyzing, testing, executing and maintaining DMN level 3-compliant decision models as well as best practices to incorporate in an enterprise-level Decision Management Center of Excellence. The solution is a collaboration between the partner companies around the DMN standard. This is just one more advantage of standards: not only users are free from the costs of vendor lock-in, but it also allow vendors to collaborate in order to offer customers complete solutions. Please allow me to take a break from the technical/community oriented posts and talk a bit about something that has been on my mind a lot lately. Stick with me and let me know what you think! "- You should never stop learning. In our industry, if you stop learning, after three years you are obsolete. Do it for 5 years and you are relegated to maintaining legacy systems or worse, you are out of the market completely. " While this seems pretty obvious today, it was a big insight to that 18 years old boy. I don’t really have any data to back this claim or the timeframes mentioned, but that advice stuck with me ever since. It actually applies to everything, it doesn’t need to be technology. The gist of it: it is important to never stop learning, never stop growing, personally and professionally. That brings me to the topic I would like to talk about. Nowadays, I talk to a lot of young developers. Unfortunately, several of them when asked “What do you like to do? What is your passion?” either don’t know or just offer generic answers: “I like software development”. "But, what do you like in software development? Which books have you been reading? Which courses are you taking?" And the killer question: "which open source projects are you contributing to?" What is your passion? How do you fuel it? What are you curious about? How do you learn more about it? It doesn’t need to be software, it can be anything that interests you, but don’t waste your time. Don’t wait for others to give you time. Make your own time. And if your passion is technology or software, then it is even easier. Open Source is a lot of things to a lot of people, but let me skip ideology. Let me give you a personal perspective for it: it is a way to learn, to grow, to feed your inner kid, to show what you care for, to innovate, to help. If you think about Open Source as “free labour” or “work”, you are doing it wrong. Open source is like starting a masters degree and writing your thesis, except you don’t have teachers (you have communities), you don’t have classes (you do your own exploratory research), you don’t have homework (you apply what you learn) and you don’t have a diploma (you have your project to proudly flaunt to the world). It doesn’t matter if your project is used by the Fortune 500 or if it is your little pet that you feed every now and then. The important part is: did you grow by doing it? Are you better now than you were when you started? - Be restless, be inquisitive, be curious, be innovative, be loud! Look for things that interest you in technology, arts, sociology, nature, and go after them. Just never stop learning, never stop growing. And if your passion is software development, then your open source dream project is probably a google search away. A sneak peek into what is coming! Are you ready? As you might have guessed already, 2017 will be a great year for Drools, jBPM and Optaplanner! We have a lot of interesting things in the works! And what better opportunity to take a look under the hood at what is coming than joining us on a session, side talk or over a happy hour in the upcoming conferences? Here is a short list of the sessions we have on two great conferences in the next month! The team and myself hope to meet you there! 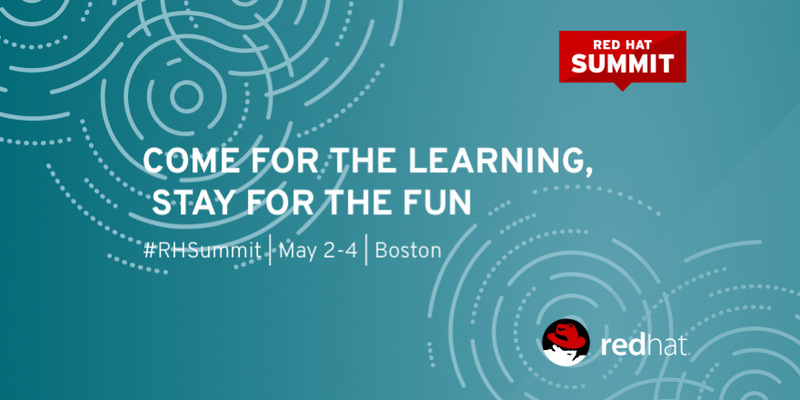 Oh, and check the bottom of this post for a discount code for the Red Hat Summit registration!